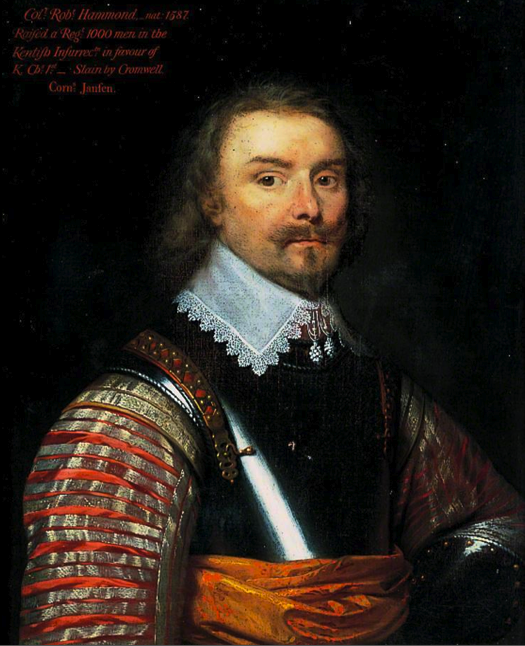 Painted at the age of seven by Cornelius Johnson in 1635. 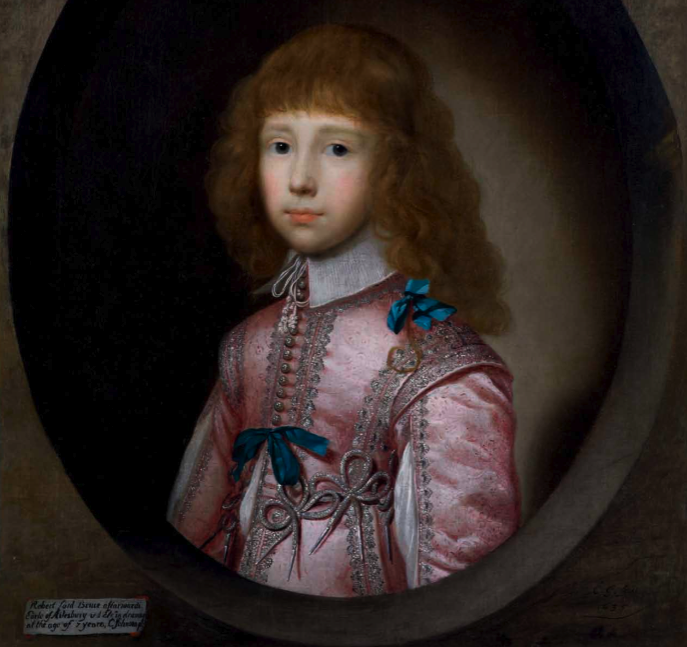 The young lord wears a silk doublet richly decorated with silver thread, blue ribbons and silver points. Just a plain falling band, but he doesn’t need anything showy with this doublet. 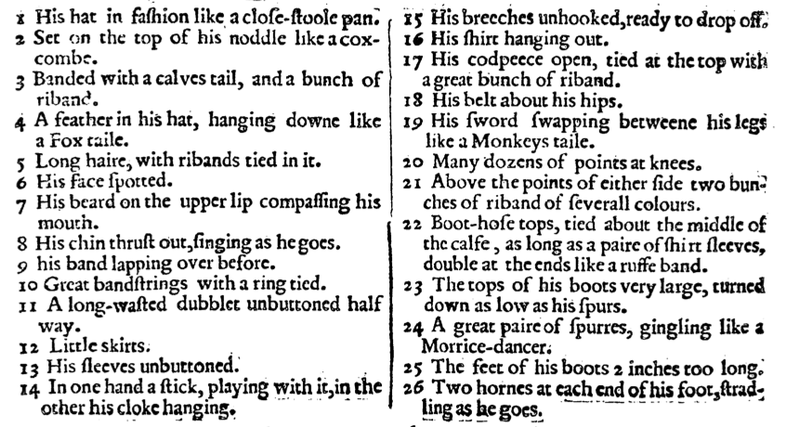 A Picture of an English Antick with a list of His Ridiculous Habits and Apish Gestures, printed in November 1646. Helpfully the author has annotated the picture for us, (see below). Number 15 could apply in 2012! 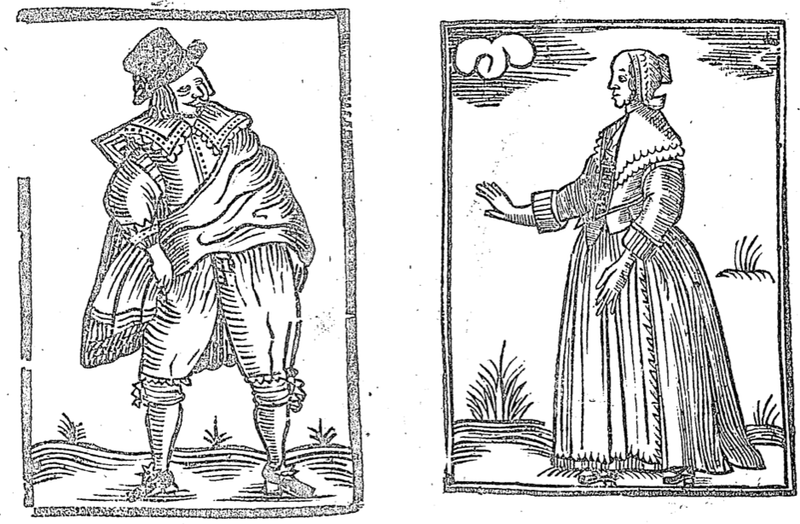 Nice pair of woodcuts from a broadside printed in 1649. The blocks look well used, but the costume style is definitely 1640s. 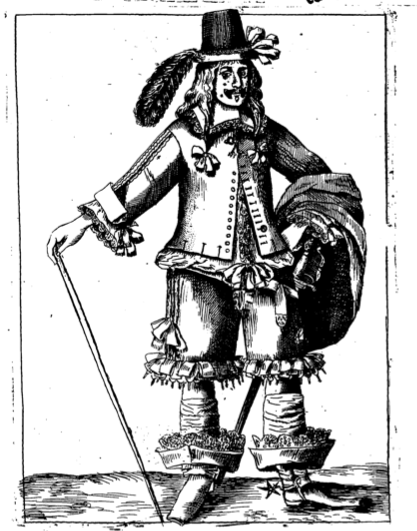 The two figures are wearing good quality civilian clothes, the man has laced falling band, braided wings on his doublet and an off-the-shoulder cloak, swept rakishly across his chest. Also a good pair of well heeled shoes with rosette ties. The lady is tidily attired with decorated kerchief, coif and apron, front lacing bodice and stout shoes. Military manual by Thomas Fisher, printed in 1642. 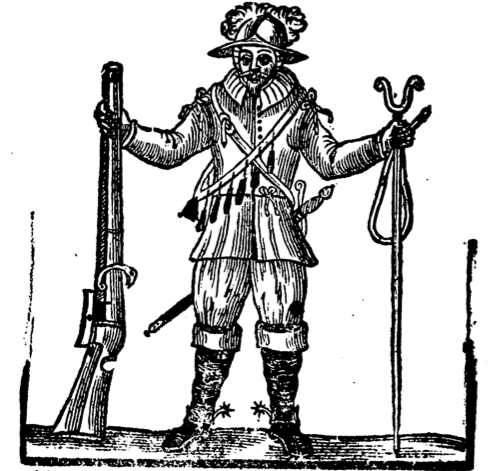 The previous woodcut appears in this book as does this, almost identical image, though this time the musketeer/dragoon is not armed to the teeth. More of the odd ties here which begin to look like points or laces through to the breeches, though the style of his coat is really too late for points. The ghost musket is a bleed through from the next page. 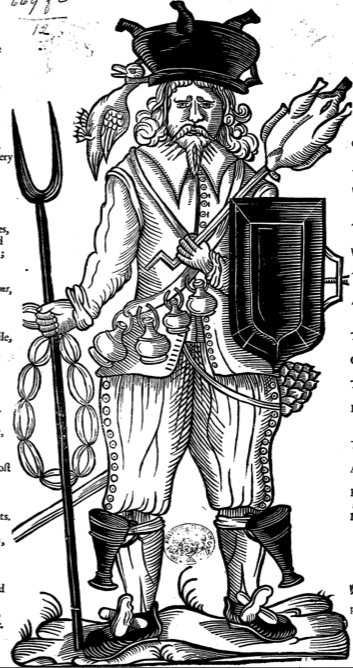 It has been suggested that these images are meant to reflect the part time soldiers of the Trayned Bandes of London. Born in Kirkham Parish in Lancashire, March 3rd 1645, according to George Thomason’s annotation on the front cover. 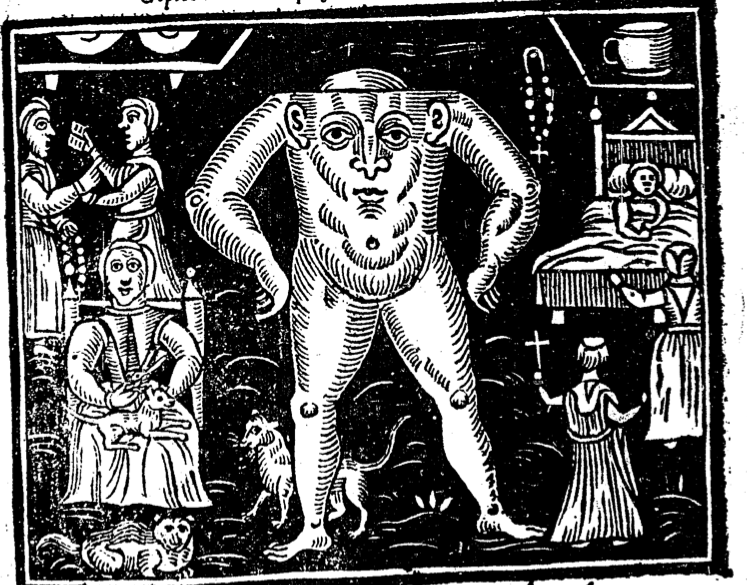 One of those “World Turned Upside Down” moralising stories about a deformed stillborn infant whose mother had badmouthed the Parliamentarians and as such was thought to have been punished with a monster for a child. The images are a bit cartoonish, but nevertheless it’s reliably dateable and there are a few decent costume details. 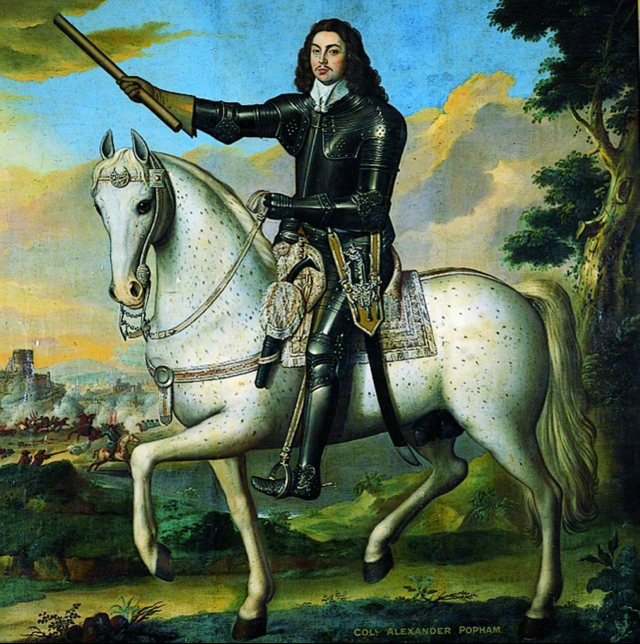 Parliamentary member and Colonell of the Littlecote garrison painted on a horse in 1650 by an unknown artist. This painting hangs in the National Armies Museum in Leeds. Notice how he has tied his large falling band so it doesn’t flap around as he’s riding. 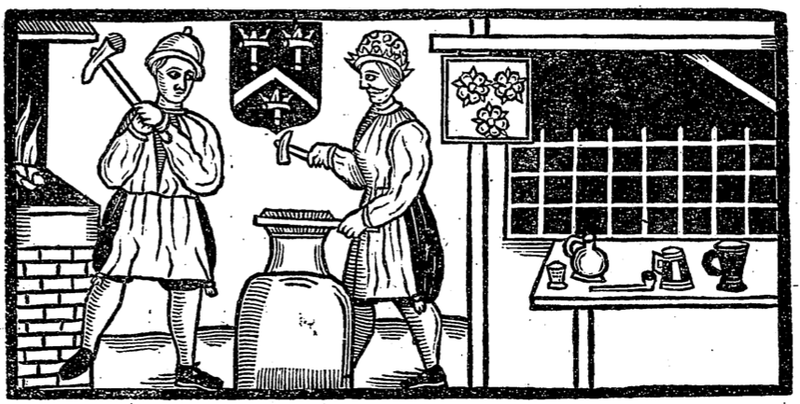 “With his new Discipline, new armes, old stomach, and new taken pillage, who would rather eate than fight.” Satirical cartoon and broadside from 1641. 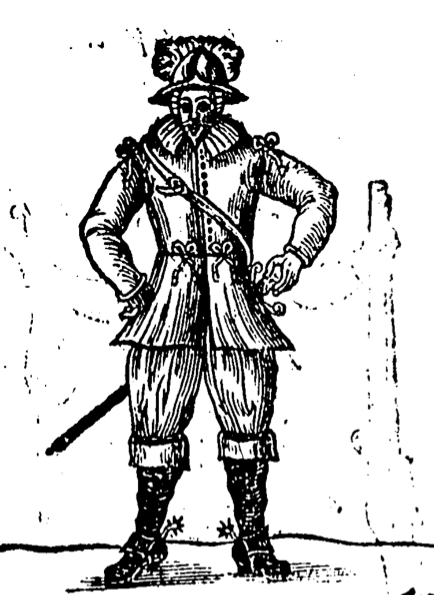 It’s cartoonish and suggesting that all English soldiers are thieves, but the his coat is spot on, buttons closely spaced all the way down, small shoulder wings and two piece sleeves with turnbacks. Big darted band for a collar.